Using the Watercolor Trio stamp set with Old Olive, Rich Razzleberry, and using some stash of now Retired color Orchid Opulence I made this card pretty quickly! (could possibly be a 10 minute card :-) I dry embossed after stamping, an effect which I really liked (disguises my lack of layered stamping finesse ) and one that I think gives it a "needle point" flavor. This embossing folder is the Square Lattice. 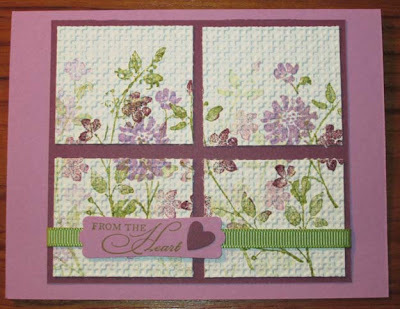 I used my very favorite punch, Modern Label, and a tiny heart from the Heart to Heart punch. Very, very pretty...love all you techniques,especially with the dry embossing....will take that home with me. 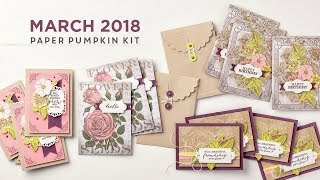 Lovely with the embossing; that is a gorgeous stamp set and I love how you used it. This is a gorgeous card! I love the colors...so pretty! Awesome effect embossing. It really does have a needlework feel to it. Fantastic! This is gorgeous! I love the dry embossing over the stamping. I really need to get a cuttlebug! Gorgeous color and design! 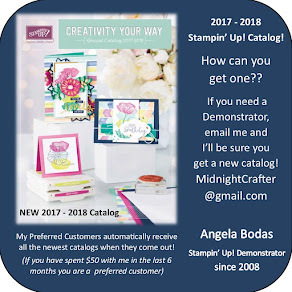 You just can't miss with that fabulous embossing folder! This is really beautiful! I love how you spread the flowers across the panels!